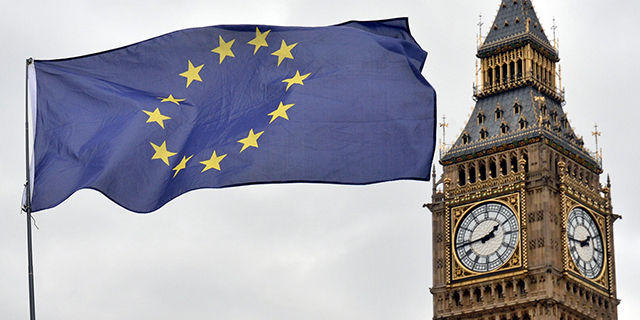 Recent years have seen turbulent shifts in public attitudes toward the European Union. Down just a year ago, before the Brexit vote in the United Kingdom, public sentiment about the European project has rebounded. Even British voters, who narrowly elected to withdraw from the EU, have markedly improved their views of the Brussels-based institution. These are some of the key findings from a new Pew Research Center survey, conducted among 9,935 respondents in France, Germany, Greece, Hungary, Italy, the Netherlands, Poland, Spain, Sweden and the United Kingdom from March 2 to April 17, 2017. Together, these 10 European Union member states account for roughly 80% of the EU population and 84% of the EU economy. 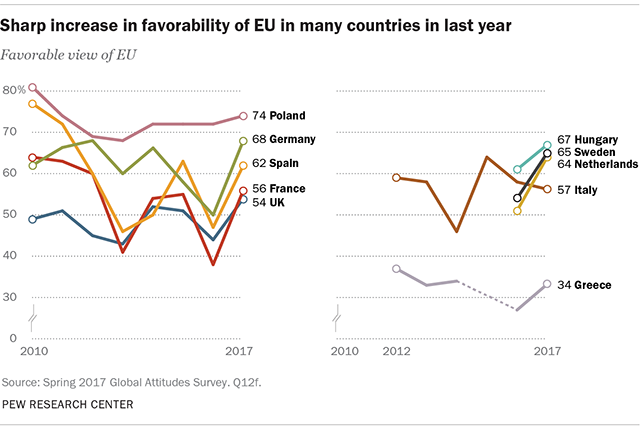 When asked about the ramifications of the UK’s impending exit from the EU, publics in other member states generally agree that the British departure will be bad for the EU. They are less certain what Brexit will mean for the UK. A median of just 18% in the nine continental EU nations surveyed want their own country to leave the EU. Greece and Italy are home to the largest support for exit, but even in these countries more than half want to remain a part of the European project. In addition, many want national governments, rather than Brussels, to control future migration both from outside the EU (a median of 74% across the nine continental European nations polled) and within the EU (a median of 66%). Moreover, a median of 51% prefer that their own governments, not Brussels, negotiate future trade agreements with the rest of the world. With Brexit looming, Germany’s influence in the EU is likely to grow. 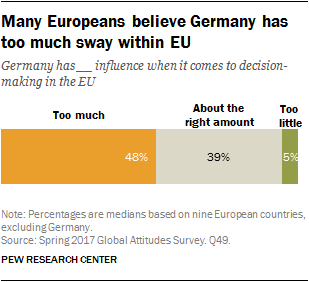 While Europeans have an overwhelmingly favorable view of Germany, a plurality (a median of 48%) believes Berlin has too much influence when it comes to decision-making in the EU. Even as many Europeans want key powers to be transferred from Brussels to national capitals, local politics are far from stable. The past year has seen close, contentious elections in a number of EU member states, as well as newer political movements and parties outperforming established organizations. Overall, few political parties enjoy broad popular support. The survey asked about a total of 42 parties across the nations polled, and only five of those parties received a positive rating: two in Germany (the Social Democrats and Christian Democrats), two in the Netherlands (the People’s Party and the Socialists) and the Swedish Social Democratic Party. Ratings are especially grim in Greece, where no party is seen favorably by even a quarter of the public. Parties on the far right – such as France’s National Front and the United Kingdom Independence Party (UKIP) – generally get relatively low ratings. CORRECTION (June 2017): The data in this report and the accompanying topline have been corrected to reflect a revised weight for Greece and Italy in 2017. The changes due to this adjustment are very minor and do not materially change the analysis of the report.